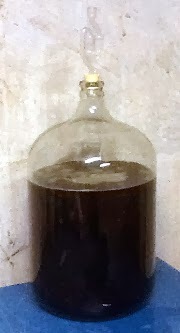 Today, after 8 days in the primary fermenter, I transferred the stout over to the secondary. Gravity reads 1.026 at 64°, which has a virtually negligible correction factor to 60°…to 1.026. Down from an original gravity of 1.062, this leaves around 4.7% abv at the moment. Assuming that the lactose in the recipe is almost completely unfermentable, I should be pretty close to final gravity with this one, judging by the calculations in BeerSmith. Based on my tasting at the time of transfer, this is going to be an absolutely delicious stout. It is smooth and creamy, and I was pleasantly surprised to have a mild but distinct cocoa finish pop in a few seconds after each sip. However, it’s also a “big” and hearty beer…I think I’m probably going to stick with almost exclusively 12-oz. bottles for this one. An 18- or 22-oz. pour would be just too filling to enjoy. 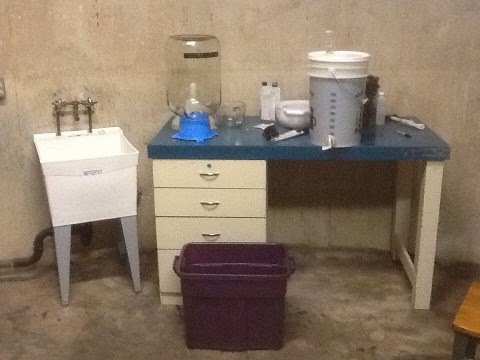 This transfer session is also notable as the first time I’ve used my “new” brewing setup in the garage. I finally got some time to swap out the old utility sink (which was covered in grease, old paint, and other grunge) and set up a re-purposed work bench. Just on this first run it is much more convenient than the kitchen counter! The new brewery location…not in the kitchen. This entry was posted in milk stout, miscellaneous, stout and tagged BHCS. Bookmark the permalink.